Phone Friends! | RV There Yet? Remember when you were young and had pen pals in far away places? Well, for the last 10 years I’ve talked with (and made friends with) many people from far away places that I never expected to be able to meet. (They don’t let us “clerical” folks out of the office much!) This week I’ve been able to finally put faces with several of the voices that became my friends over the years. We started with a Friday morning visit to the US headquarters for Wago Corp. in Germantown, WI (outside of Milwaukee). My friend Mike G. showed me around and I got to meet all the other folks (like Kim and Wendy) that I had spoken with over the years. It was great to see the whole operation, and finally meet these “phone buddies”. From there we headed up to Fond du Lac – which is at the bottom of Lake Winnebago. There I hooked up with two phone buddies from Giddings & Lewis – plus got to greet several other folks that had “crossed my desk” over my years at HPI. 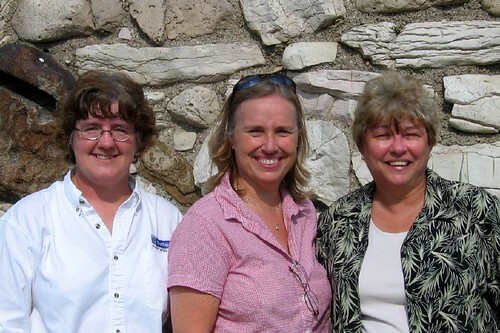 Here’s a picture of Barb, Carol and I at the lighthouse at Fond du Lac. It’s been one of the true perks of this adventure, being able to finally meet these “phone friends”. Tomorrow (Monday) we’ll be in Minneapolis meeting more “phone friends” – What fun! So which one is Barb and which one is Carol?? And how about some pictures of Mike and the crew! It sure is great that you finally got to meet these guys in person. If you talk to them any time soon please tell them that I think of them often! Barb is on the left and Carol is on the right. Somehow the camera never made it out of the bag at Wago – sorry!